Pet owners are becoming more aware of the importance of dental care for both cats and dogs. Years ago, most people shrugged off this important service, thinking that it was just another trendy treatment that wasn’t necessary unless their pet had severe dental problems. Today, a more preventive approach is being taken at veterinary clinics and hospitals nationwide, as the statistics surrounding dental care for pets and related health issues prove its importance. Feline dental care and canine dental care, as well as advanced dentistry in Dartmouth, are all available at Anchor Animal Hospital. Most people just assume that dogs and cats should have bad breath all the time. After all, they lick everything, and the food that they enjoy so much doesn’t exactly smell appetizing. However, bad breath in dogs and cats can be a sign of bigger dental issues and disease, so it is worth having it checked out by a reputable veterinarian. In fact, nearly eighty-five percent of all pets will have some degree of periodontal disease by the time that they are just three years of age. Unfortunately, they can’t tell us when they have a toothache or if it hurts to chew their food, so we need to be proactive and bring them in for regular check-ups with a veterinarian who specializes in advanced dentistry in Dartmouth. If left untreated, dental disease can lead to tooth loss, and the bacteria that forms underneath the gums can travel to the liver, kidneys, and even the heart, resulting in serious health issues. The only way that plaque and tartar can be removed from your pet’s teeth is to get a professional dental cleaning. Make sure that your vet offers canine dental care or feline dental care, depending on the type of pet that you have. Ask about additional services for loose teeth, bad breath, and any other mouth issues that may have occurred. In most cases, a thorough cleaning requires the pet to be under anesthesia, so it is important to work with a vet who is experienced in providing quality dental care for pets. In between professional dental cleanings, home dental care and ongoing maintenance are highly recommended for pet owners. While most pets are not happy about getting their teeth brushed, it can be done. Regular at-home cleanings can work to improve your pet’s mouth and increase the amount of time between extensive cleanings and other advanced dentistry in Dartmouth at your veterinarian’s office. 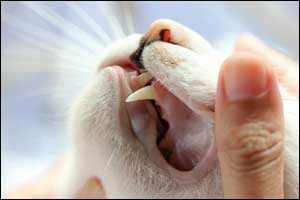 Ask your veterinarian for tips that you can use to provide better canine dental care and feline dental care at-home. They can recommend different approaches, tools, and products that will help you to be more successful with dental care. Periodontal disease is a serious and progressive disease that affects the supporting tissues that surround the teeth. It is the number one cause of early tooth loss in pets and people. It begins when bacteria combines with leftover food particles. It forms plaque on the teeth, which can harden and form tartar within just a few days. When you provide dental care for pets on a regular basis, you get a chance to inspect your pet’s teeth and recognize issues beyond bad breath in dogs and cats. This can help you to catch a dental disease in the early stages before it becomes a serious problem. When looking for tartar, it can appear in the mouth as a brown-gold colored buildup on the teeth, typically very close to the gumline. If any bleeding or redness is found near the gumline, it could indicate that gingivitis is already occurring. In that case, bring your pet in for a veterinary check-up at your earliest convenience to determine if advanced dentistry in Dartmouth is needed. Whether you are seeking a check-up for feline dental care, canine dental care, or if you know that you need advanced dental care for pets, give us a call at 508-996-3731. Our team can answer any questions that you might have or schedule an appointment to take care of preventive services, veterinary check-ups, treatments, and much more. Don’t overlook initial signs, such as bad breath in dogs and cats. Bring your pet to Anchor Animal Hospital for quality care and professional services in the South Coast area.